Full of character, authenticity and history, Mont-Saint-Jean Farm invites you to discover its hidden treasures. At the shop, you will find a wide range of regional brewery products. Its events allow you to enter the universe of this important historical site, and its museum called “The reverse of the medal” brings the history of the English hospital back to life. So come and visit this estate where the Beer of Bravery is brewed! Discover the British field hospital of the Battle of Waterloo. On 18 June 1815, the Duke of Wellington used Mont-Saint-Jean Farm as a field hospital in the very centre of the battlefield of Waterloo. This wonderful site’s museum exhibition featuring the most remarkable items and illustrations allows you to discover how the 7,000 wounded soldiers were treated; a real must-see among the battlefield museums. The microbrewery where Waterloo Beer is brewed is located within the walls of Mont-Saint-Jean Farm. This brewing activity dates back to the early 15th century. One of our brewers will take you on a guided tour where you can discover the craft brewing process. 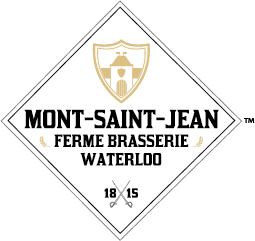 Come and taste the Beer of Bravery in the very heart of the historical Mont-Saint-Jean Farm! the Orangerie and the barn form a majestic whole full of charm and offer you the best infrastructure to organise your event. In addition, public events to which you are invited take place throughout the year. They provide an opportunity to discover the heart and soul of Mont-Saint-Jean Farm!